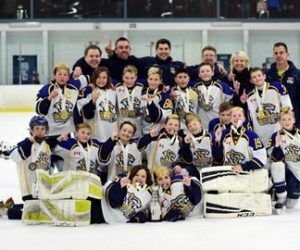 Congrats to the Whitby Wildcats atom AA hockey who literally “Shutout” the competition in the Toronto Avalanche March Meltdown tournament. Finishing first overall in the round robin, the Whitby Wildcats downed the Clarington Toros 4-0 in the semis and went on to dispatch the Newmarket Redmen 2-0 in the championship final. In six tournament games, the Whitby Wildcats amassed 25 goals routing their rivals without allowing any goals against, an outstanding performance typical of the team this season. The latest championship marked the fourth tournament win in five years, closing out a season of 59 -7-7.